Winter is almost here on the beautiful Oregon coast! The weather is often surprisingly lovely during this time of year, and storm watching over the ocean is wonderful from the warmth of the living room and its floor length windows. Enjoy lower rates through April with rates of $350 a night, or $2100 for a full week (you receive the 7th night free). Absolutely fabulous views welcome you to this 2 story, classic Beach Front Home. As well as 4 Bedrooms, including 2 with floor to ceiling ocean views and king size beds, it has a large recreation room, complete with pool table. There is a glassed-in ocean view, wind protected patio with a gas barbecue. Step across the back lawn and descend the 30 steps to your secluded entertainment deck on your way 50 yards through a private willow shrouded path, ending at the Famous Bandon Beach, complete with breath taking rock stack formations and broad sandy expanses. This beautiful home is located just 10 minutes from the Fabulous Bandon Dunes Golf Resort, north on Hwy 101, with its 3 famous courses. Ten minutes to the south, there is the new Bandon Crossings Golf Course, as well. The Bandon Marsh Estuary and New River offer incredible shorebird watching, just minutes away. There is wonderful seasonal fishing and crabbing in the local Coquille River, and 20 minutes away are the pristine Elk and Sixes Rivers as well as the famous Rogue River, an hours drive to the South. Sunset Horseback riding on the Bandon Beach is an incredible experience, and biking and kayaking in such a scenic environment create memories you will never forget. You might just want to sit in the Floor to Ceiling Ocean View Living Room and watch for seasonal whales or, during the winter, enjoy the thrill of dramatic storms in front of a roaring fire. The Restaurants in Old Town Bandon have some of the freshest locally caught seafood you will ever taste, and Shopping in Scenic Old Town Bandon, along the waterfront, is another truly memorable experience. Immerse yourself in this setting and see why visitors return again and again. toilet, combination tub/shower, Sink & vanity are separated from toilet/tub by second door. Unobstructed views of the beautiful Pacific Ocean, with private beach access right off the back deck. Glass dining table overlooking ocean. Seats for 8, with 2 additional chairs that may be brought over. 2 balconies, one off of each of the upstairs bedrooms. Also a main deck off living room, overlooking ocean. Step across the back lawn and descend 30 steps to a secluded cocktail deck, on the way down a private willow shrouded path, leading 50 yards to the incredible Bandon Beach. Beautiful home and incredible location. Loved Loved Loved this house!! Beautiful views and nice access to beach. Kitchen nicely stocked. Beds are comfy. Pool table provided hours of fun! We will definitely stay here again. perfect for our family Christmas!!! Fantastic house!! Property managers were great and responded quickly to our questions. Beautiful views. Would definitely return. Perfect vacation, stunning views, and well managed property. We will be back ASAP. Everything we needed was provided in this spacious and gorgeous house. The beds were comfortable, the kitchen well equipped and the beauty breathtaking out each window. Loved every minute!!! We loved being right near Face Rock and the amazing rocks, tidepools, and beach formations. The sunset was amazing and we walked out to the sand and rocks many times and LOVED it! The house was clean, but is a bit tired in places. The cocktail deck is basically useless- overgrown, ZERO view of the beach, too far from house to be worth it. The hot tub is tucked back and has limited ocean views and not all the functions on it work any more. The mini blinds in some of the bedrooms are almost impossible to raise/lower. The house also needs fireplace tools- hard to have a fire without the tools to rearrange logs. No Bluray player on any of the TVs if the kids want to watch a movie- DVDs only. Be aware- this rental home is IMMEDIATELY connected to a second home on the same lot which is separated by a shared patio/open space outside where the hot tub sits. No one used the other home while we were there, but if they had, the privacy of this rental would be severely compromised. All that being said, the house is in a great spot and is furnished well. The mattresses and sheets were very comfortable. Brand new washer and dryer were nice and the pool table was fun. The contacts for the property were helpful and friendly and easy to work with. The cocktail patio has never had a beach view, it's there simply as a private outdoor space to rest on your way down from the house to beach. There is another house on the opposite side of the wind enclosed patio, but their entrance to the patio is blocked from the inside, with both viewing and physical access completely unavailable from that end, thus ensuring complete guest privacy at all times. The patio and jacuzzi are always solely for the use of the renters and never shared. Again, we really do appreciate the feedback and having the opportunity to address it! We are 10 minutes from the famous Bandon Dunes Golf Resort, and the well known Bandon Marsh and New River bird watching habitats. We also have wonderful seasonal whale watching. All vacation rentals in the Oregon require a 1.8% State of Oregon Tourism tax. 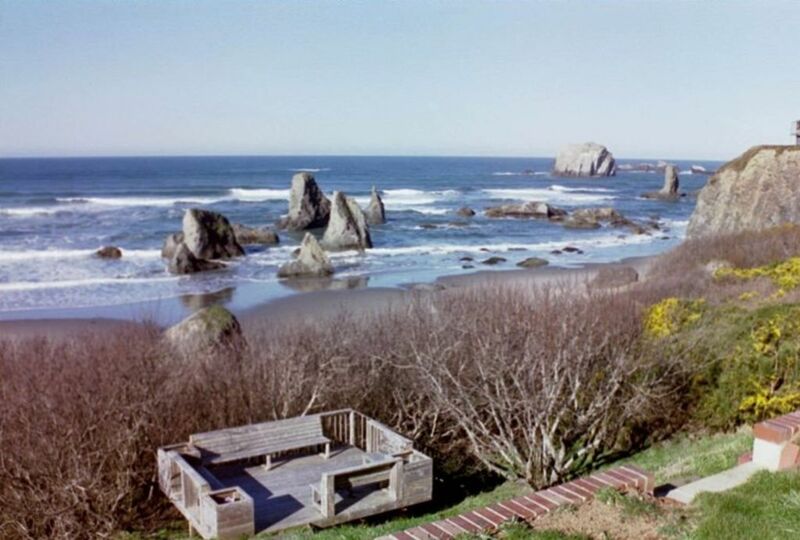 Vacation Rentals in the Bandon city limits require a 6% Transient Occupancy tax.